﻿ Rain Barrel World - Collecting water with rain barrels inch by inch. The purpose of this website is to talk about, what rain barrels are, what you can do with it and how to make one. I will also slightly mention subjects related to water, such as preserving water, living off the grid etc. Although the main focus of the site is rain barrels. What are water barrels or water butts anyway? as they are sometimes called in the UK. It is simply a system that collects and stores rainwater from your roof that would otherwise be lost to runoff and diverted to storm drains and streams. 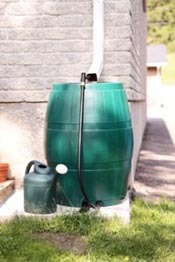 Usually a rain barrel is composed of a standard 55 gallon drum, a vinyl hose, PVC couplings, spigot, a screen grate to keep debris and insects out, and other off the shelf items such as a leaf guard and cinder blocks to use as a stand for the barrel. It is relatively simple and inexpensive to construct and can sit conveniently under any residential gutter down spout. People use a lot of water for drinking, cooking, washing and irrigating landscapes. Think for a minute other uses for water? Water is also used for the production of wood, paper, clothing, running a building, chemicals, gasoline and crops. Imagine a drought, or not having a good rainfall for days, or simply water being banned. You never know, it's always good to be preventive. Especially during the hot summer months, sometimes it rains a lot, and then you could spend weeks without a single drop of rain. That's where a water barrel comes in handy. Rainwater by nature is a soft water, void of harsh chemicals or pollutants, usually hitting the soil in its purest form. It is the most precious source of freshwater on earth, and the most readily available. Rain is perfect for indoor and outdoor plants. Watering plants with warm water in a barrel reduces shock and damping off of transplants. Remember that plants love warm water, not water that's going to shock them, natural water, free water. Preserving water not only helps protect the environment, it saves you money and energy (decreased demand for treated tap water). Collecting rain water has become as typical as recycling bottles, cans, newspapers and composting, but not enough people are doing it. It's not something that's expensive to do and it's low cost to maintain. Living in a hot country or state, I would have the water barrels out all the time. If you have a few months of summer like me, take advantage of that short period of time to start saving rainwater. Link two or three barrels together and you can save up to 180 gallons of precious rain water.Why use tap water when you can use water mother nature already provides free of all the chemicals. Follow me along this journey as we explore the wonderful world of water barrels and the many positive things it can do for you, your home and garden. saving-rain-water should be a priority, Americans rang highest water consumers in the world, followed by Canadians in 2nd place. Do You Collect Rain Water? Saving rain water is important to us all ! If you collect rain water to recycle and reuse at your home or business, please share your stories and collecting rainwater tips here.